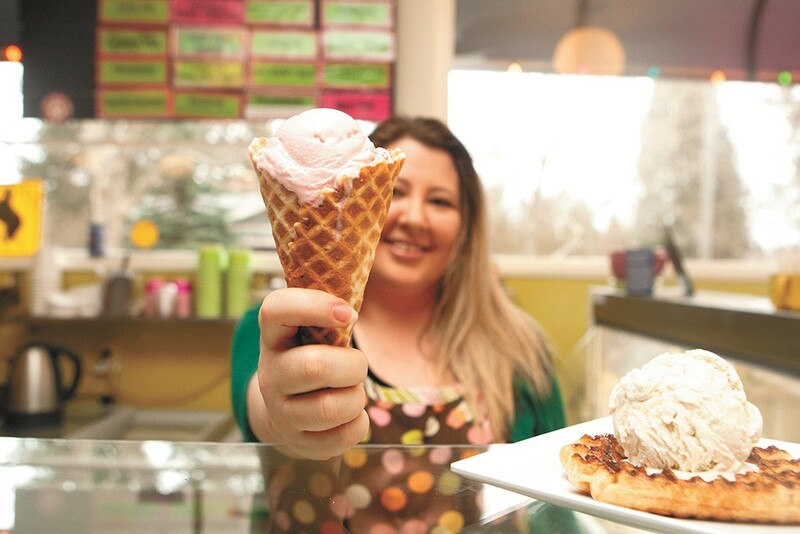 Owner of the Scoop, Jennifer Davis, with a waffle cone of Brain Freeze's strawberry ice cream. As soon as school's out for the day, kids from Wilson Elementary cross the street and pour into the Scoop. Jennifer Davis, owner of the South Hill ice cream shop, greets them like family, helps them get their after-school snacks and snaps a few pictures of kids posing for the customer slideshow displayed on a screen against the electric pink and green walls. Davis' daughter used to be one of those kids. The Scoop was their after-school pickup spot when she went to Wilson, before Davis and her mom bought the Scoop in 2011. "Our thing was, 'Meet me at the Scoop. Get a soda, brownie, bag of chips or scoop of ice cream and meet me out here,'" Davis says. So when she heard the previous owners were moving to Japan, Davis jumped at the chance to buy the Scoop, and became the new person selling delectable ice cream to the neighborhood and whoever else ventured to their somewhat off-the-beaten-path spot on 25th Avenue. Davis says she likes selling a local product, especially the creative flavors Brain Freeze comes up with, which number more than 100. "We have a lot of input in new flavors, tweaking existing flavors," Davis says. "And it's another family business like we are." Back in 2003, the Scoop originally opened in the Perry District. Its owner owned and operated Brain Freeze at another location. The companies now have separate owners, with the Scoop moving to the South Hill. Next month, Brain Freeze plans to open an ice cream shop in Kendall Yards, while continuing to supply ice cream to more than 10 local businesses. The Scoop is more than just an ice cream shop. The menu is chock-full of baked goods, sandwiches, breakfast food and coffee. The best part: The ice cream and food intersect. Add a scoop or two of ice cream to one of Davis' liege waffles (which have become quite the hit), an oat bar, between two cookies or over a warm brownie.